BASC completed its first cleanup drive in Kumaraparvatha (KP) on the occasion of its 5th B'Day. 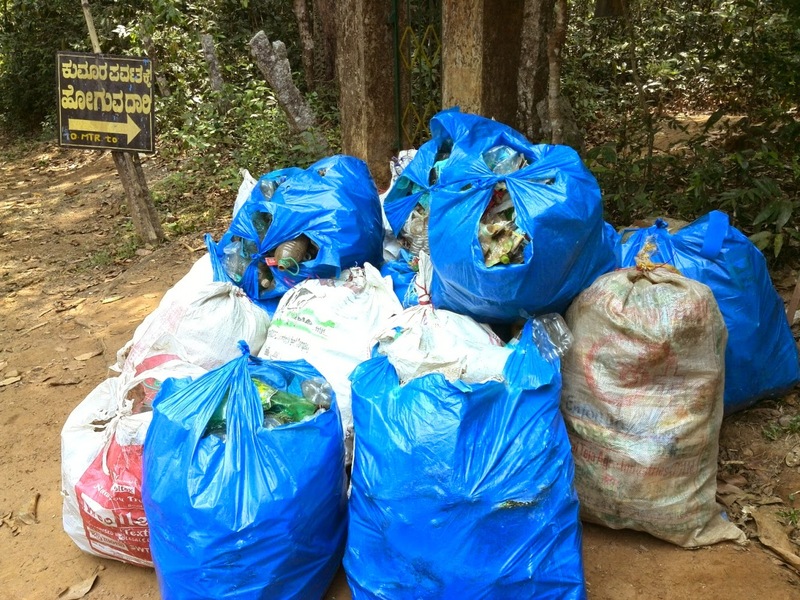 A big THANKS to all the participants (Satya, Sandeep, Anitha, Vinuthna, Ramkumar, Govind, Ram roop, Sreedhar, Srikanth, Kamal & Skanda) for the hard work done in collecting garbage and taking it back to Kukke. Team work made BASC's first clean-up drive a successful event. Also thanks to driver, Chetan & his friend Lokesh for joining us in cleanup drive. We collected 22 bags of garbage!!! And same we took back to Bangalore and dumped in plastic recycle plant near Nayandahalli. Thanks to plant owner Selva who waited for us till 11:15PM. Let me breakdown my post event write up into two parts. 2. General Event write up. 1. Cleanup drive and creating awareness. I never imagined a cleanup drive would be so much fun. As a team we got to undo at least some of the mess, which some people had left behind. We could not completely wipe out the man made hazardous materials, but it was a great attempt though. If more and more individuals come together and work together we not only can make Kumaraparvata litter free but also create a basic awareness amongst all those nature lovers who come to Kumaraparvata, to be more responsible. (Applies to other places too). A big round of thanks to the entire team who stood united during the whole event. Also a special thanks to our driver Chetan and spotter Lokesh, who voluntarily participated in the cleanup event and also helped us to bring back the wastage to Bangalore. Thanks to Ambareesh Karanth for short listing me for this event. No sooner I saw the registrations open for BASC Kumaraparvata clean up drive, event. I registered. I was looking forward for the clean up activity but prior to the trek my main motivation was to reach the peak. (Nothing to hide though). We did not reach the peak, but in the end and I came out as a proud and happy man after making some contribution during this event. It all started on a Friday late evening 18th April at 10PM where we assembled for our pickup. Amongst the whole team, I only knew Ram Roop as I had met him during the Hampi photography event. Around 10:20PM odd, our vehicle arrived. Surprisingly we could see a driver and along side him was another person, you can call him navigator/spotter/cleaner. Let me tell you these two people not only accompanied us to Kukke but also till Bhattara Mane, involving in the cleanup activity all the way. It was like having two extra pair of hands and indeed a pleasant surprise. Believe me it helped a lot too! Others in the group comprised of Ram Kumar, Govind, Ambareesh, Satya, Skanda, Kamal, Dr Srikant, Sridhar, Anita and Vinutna. Chetan was the driver and Lokesh was his friend accompanying him. It was a regular drive on Mangalore highway where heavy rains greeted us after Kunigal. For few minutes it was rain, rain and more rain. Eventually, after around 25-30 minutes of time, it stopped to rain. We had couple of breaks during the journey, one initially, just after the 60 kilometer toll road ends and the other one somewhere near Sakaleshpura. We made it to Kukke around 4 20 AM. The van was parked next to the Kumaradhara river. We got freshened up in a while and around 6 10 AM we started towards Kukke. We had breakfast at the hotel opposite to Neo Mysore Cafe. We filled our water bottles were about to start for the trek. There was a change in plan. Initially we thought, all would go to the peak and camp. But since it was raining in Kukke since 4 days, we thought of reaching the peak and coming back to Bhattaramane. Chetan and Lokesh told, they would accompany us along the trek. Ambareesh split the entire team of 12 + 2 into two. First Team which would trek fast and reach the peak and start cleaning from the Kumaraparvata peak. Second Team which would start cleanup activity right from ground zero, I mean from the (main road) entrance till Bhattaramane. It was 7 AM i think when we started. Being part of the first team, I felt good, I thought I could trek fast and cover good distance and start cleanup at the peak. The team comprised of Govind, Ram Kumar, Ram Roop, Satya, Skanda, myself and Sridhar. We stayed together at a good speed till Bheemana Bande after which Sridhar and myself were behind by 5 minutes than the rest of the team. We did not do any cleanup on the way and our only intention was to reach Bhattaramane quick. Then dump extra luggage and start cleaning from over there. The first team (except me and Sridhar) reached Bhattaramane around 8 40AM. I was behind by 10-12 minutes owing to my cramps and Sridhar was behind me by 3 minutes or so. But the good thing was I walked alone. So much serenity, so much silence, nature at its best, cannot ask for more. The humidity was there, but that was sidelined. When I reached Bhattaramane, Ram and others were ready to make a move. I too immediately reduced my baggage weight by unloading some of the stuffs at Bhattaramane. Meanwhile Sridhar too came. All of us then made a move towards the forest check post, and Sridhar caught up with us over there. This was the first time, I was making a move from Bhattaramane this early and that too without lunch. For a minute I was wondering whether, not having food would make a difference. But it did not. It indeed was a time saver. We reached the first view point and started picking litter over there. Then towards second view point and slowly we gathered litter all along the way till Kallu Mantap water source. It was 11 45 AM I guess. We had covered whole lot of ground and also reached Mantap pretty quick. Ram and Govind decided we would finish snacks/food and then start once again with the cleanup. So we took a break near the Kallu mantap water source and after 20 minutes we were back again. Dividing ourselves into different teams, we scouted the area around the water source for 1.5 hours more. We ended up with 4 full bags of waste. Govind's bag was a huge one more than 7 kilos. While me and Sridhar took a break near the water source, Ram, Govind and others made a move to the Kallu mantap, to put up banners asking nature lovers to keep KP clean. At 1 40PM, we took a call, not to move towards the peak, due to many reasons. One being time constraint. It would be difficult to reach peak, do a cleanup and then bring back waste, before it turns dark. And we did not have torches too. Second being chances of rain. If it rains, its really difficult to manage, since few of us were carrying lot of luggage. So we headed right back to Bhattaramane. Initially I was disappointed that, I could not reach the peak. But, yeah, reaching peak was never the event's priority. It was cleanup. Getting down was a bit tough, the way was packed with stones. Ram, Govind, Satya, Sridhar each carried one fully loaded bag containing plastic waste. Me and Skanda initially managed to share the load by carrying the bag using a stick, with each one holding one end. But it was difficult and needed synchronization. The moment Skanda took the bag by himself, he rocketed. Meanwhile Ram and Govind too were ahead of us. So it was 4 of us behind, Ram, Satya, Sridhar and me. After certain distance, Ram took up Satya’s bag and me took Sridhar's bag. We finally made it to forest check post at around 4 50 PM or something. Ambareesh and others were about to enter the forest, looking out for us, if we needed any help to get the waste bags back. Now the whole team came back to Bhattaramane. We freshened up and it was a pleasant surprise to see, lunch was still available. Food felt really good after this cleanup exercise. Ate till my stomach was full and took couple of minutes to rest. Ram Roop went towards view point 1 to take some pictures and rest of the crew headed to a nearby view point. Evening dinner was served at 8PM. Then it was sleep time. We woke up early. Everyone was now focused on how to get the bags down and also collect the waste bags which had been gathered by Team 2 along the way. Yes Team 2 had worked pretty hard to gather stuffs along the way to Bhattaramane. In the process they had accumulated the litter at certain points, which needed to be picked up along the way down. Started early, Satya, took one waste gunny bag and headed first then, Ram Kumar and Ram Roop headed with their gunny bags too followed by Govind and Ambareesh. Skanda managed to take Govind's backpack along with his and Kamal took Ram Kumar's and one more backpack with him . Vinuthna took Satya's backpack along with hers, I had my backpack and one gunny bag with me. Anita, Vinuthna , Dr Srikant, Sridhar, Chetan and Lokesh were the one's who were looking out for waste and litter along the way. Rest of them, had loaded and sealed bags, hence proceeded right with the descent. As usual, I was the slowest during the descent, but right after Bhattaramane, where we encounter a major dustbin, Govind, Ambareesh, Anita, Sridhar, Dr Srikant, stayed back segregating the waste from the dustbin and picking plastic ones. Now I got a chance to move ahead. Meanwhile Skanda too started looking out for litter along the way. On the way, I then caught up with Ram Kumar and Kamal who were taking a breather. Then I caught up with Vinuthna, Lokesh and Chetan. Their tally of bags had almost doubled. Together between them they now had 6 plastic bags hanging by a big wooden stick plus their backpacks. Later I took a break when some of the guys moved ahead. Meanwhile, Ram Roop and Satya had made it to the main road ,and Satya was back again, to take few more bags. Eventually the whole team was back to the entrance by 10 15 AM. Ram Kumar, Chetan and Lokesh went ahead to bring the vehicle near the entrance so that we could load the bags right up over here. A family who noticed and appreciated what we were doing, agreed to drop Ram Kumar, Chetan and Lokesh to the place where our TT was parked. Indeed thanks to them. One more team from Mangalore comprising of 4-5 guys lent us their entire nylon thread which we used to tie up few bags. Thanks to you too guys. But we could only load few of the bags since there was a electric wire, which would come in contact with the bags. So with few bags loaded we headed towards Kumaradhara river where we found shelter under a tree and loads of time to tie up the bags on top of the van. All the huge bags were now bundled into medium size gunny bags and the total tally went up to 22 bags. Chetan and Govind did a tremendous job in loading the bags on the van and later all of us made it to the Kumaradhara river to take a dip. The water was warm and it felt good. The cleanup activity was a success. We felt refreshed and then we moved to the same hotel where we had our breakfast. Completed our lunch and were off by 3 30 PM. With couple of breaks in between we made it to Nelamangala by 9 30 PM. We could make it to Nayandahalli by 11 PM after dropping few of them at Shantala Silks. I got down at Nayandahalli, where the van proceeded to a recycler. So two days of sheer fun & hard work came to a close. > Loads of time spent amidst nature. > Doing our bit, in keeping KP clean. > Meeting interesting & like-minded people. On the weekend before Earth Day ( 22nd April ) 12 enthusiastic members from BASC embarked on an ambitious and noble cause of removing the non bio-degradable waste ( plastics bottles , covers etc ) from the beautiful Kumara Parvatha . We arrived at Kukke at 4:30 AM on Saturday 19/April/2014 and after having a heavy breakfast we split-up into two teams comprising of 7 members. I was part of the team comprising of Ramkumar , Govind , Skanda , Satya, Srikanth and Sandeep and our task was to clean up the region starting from Bhattru Mane to the peak. We started our trek at 7:00AM and our staggering pace ensured that we reached Bhattru Mane at 8:40 AM . From Bhattru Mane we went to the office of the forest guard. The officer there was pleased to hear about the brilliant initiative by Bangalore Ascenders and even offered to help us by requesting his sub-ordinate to assist us with disposing the garbage. As we trekked towards the Kallu Mantapa it was clear that we will have an extremely difficult task of clearing the massive garbage left behind. After filling multiple bags of garbage it was clear that it would not be feasible to trek beyond Kallu Mantapa and go towards the peak owing to time constraints. After collecting all the garbage around Kallu Mantapa we headed back to Bhatru Mane . A few of us felt adventurous and slept at the breathtaking view point - “Raja Seat” . Even though most of us had sleeping bags we were forced to use a tarpaulin sheet as a bed sheet owing to the intermittent rain fall. The next day ( Sunday 20/April/2014 ) we left Bhattru Mane at 8:10Am as we knew that our descend will be extremely slow as each of us had to carry a garbage bag in addition to our trekking bag. After reaching the base of the mountain we tied the garbage bags to the top of our Tempo Traveller and cooled ourselves in a nearby lake. Next we ate a sumptuous lunch and headed back to Bangalore. · A dominos pizza box + the seasoning, etc. Each of us had a great experience at KP and we are happy that we removed as much garbage as possible from the beautiful peak . The task of having a clean and green Kumara Parvatha will be tough and each of us realize that this initiative should be repeated multiple times to achieve that goal , but “ A journey of a thousand miles starts with a single step “ , and I am glad that Bangalore Ascenders ( special thanks to Ambareesh for organizing the event ) have taken the initiative to kick start “project KP” ( taking the liberty to give the initiative a name ).